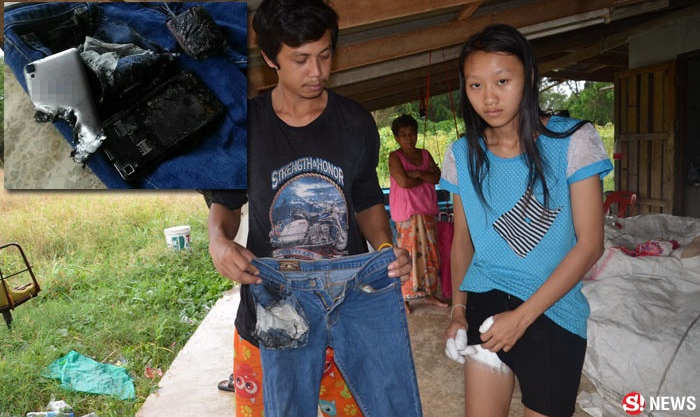 Roongrat Thiramsuk will probably won’t put her future phone in her pocket anymore after the phone she last used exploded in her pants pocket on Saturday. The 19-year-old factory worker in Nakhon Pathom suffered burns on her stomach, right leg, and four of her fingers. She said she was at work when her smartphone vibrated and thought someone texted her. However, the phone was already melting in her pocket with smoke coming out of her pants. The teen tried to remove her phone instantly from her pocket, but she was late in doing so. Her gadget already burned her leg and some parts of her body. People in the factory who rushed to help her ripped her jeans pocket off. The phone dropped to the floor and later flared up. “It only vibrated. When it stopped, I immediately felt the burn. I wasn’t able to remove it out in time. The phone already melted to my leg,” Roongrat told TNN. “I didn’t leave an app open and I was not charging my phone either. It was just there, sitting in my pocket,” Roongrat added. According to a report from Coconuts Bangkok, the label of the phone was not reported, but Roongrat said she had only been using it for one year. She was then sent to the hospital to receive medical treatment for her burns. After the incident, Pongsakorn Kaewchannua, director of National Broadcasting and Telecommunications Commission of Suphan Buri, paid Roongrat a visit at her home to ask her some questions. In a report from Sanook, the director said it was NBTC’s responsibility in taking care of consumers. He also got in touch with the phone company who promised that Roongrat will be compensated, and her medical cost covered.